Drawing and painting often get lumped together as sister media, as if both were equal means of manual image creation, one only wetter than the other. I think of the two as more different than that. Where painting came into its own as method of image production, drawing has a less aesthetic history as a temporary means of recording, organizing, and understanding data. At core, drawing uses and makes up for the failing of language, describing spirals and scales and complex causality in a way that words can’t. 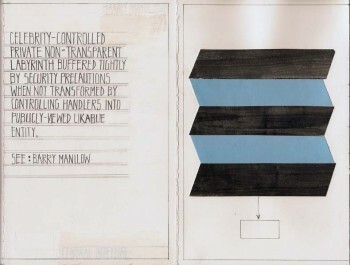 This schematic and graphic element of Chicago artist Deb Sokolow‘s work always appealed to me, especially as the neurotically left-brained drawings – etched out in straight lines and bullet points – gave hard corners to the wandering paranoia of the artist’s content. It may take twenty feet of paper and thirty erased rephrasing, but I knew the artist was going to explain to me in a perfectly sensible, footnoted, annotated, and illustrated manner exactly how they were after her. While Sokolow’s latest at Western Exhibitions is a departure from earlier forms, all of that above-mentioned content is preserved. There is still the regular cast – a meta-narrative, a paranoid narrator, and plenty of capital letters. The humor is there (ie, always be eating a hot dog) but the themes are sometimes darker, such as the chapter on the Illinois State University Watterson Towers suicide rumor. Our narrator is much more confident, however, traveling out of the apartment and crossing state lines in search of answers. There are no passive revelations. 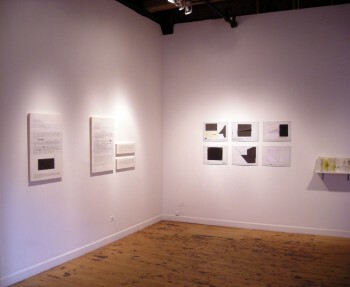 But the biggest changes are formal, with the iconic, spiraling installation form traded in for discrete objects, mostly paper on panel rectangles like blown up pages the artist’s books. This move split the story into chapters and footnotes, along with mixed-media graph-sheets and accordion side-narratives in paper. This fragmentation went both ways for me. I can appreciate how the disjointed feeling produced by separating the narrative into panels responds to the narrative itself, but the viewing experience was less engaging than the guided continuity of the wall-wrapping installations of Sokolow. 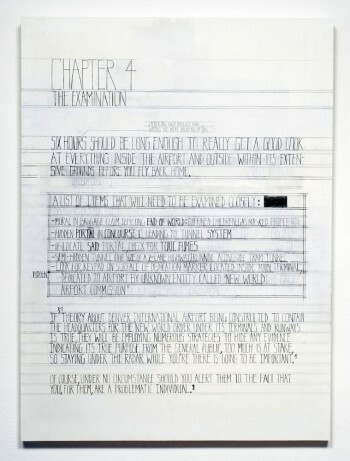 I normally exclude Deb Sokolow when complaining about the pacing of text-heavy art, but without the confusion of connected works, this was the first time that the artist’s work felt slowed down. Of course, the formal changes make sense in the context of the show. Sokolow based the exhibition on her new project of building a split-up and more or less infinite artist’s book, with chapters out of order and lacking direct connection. 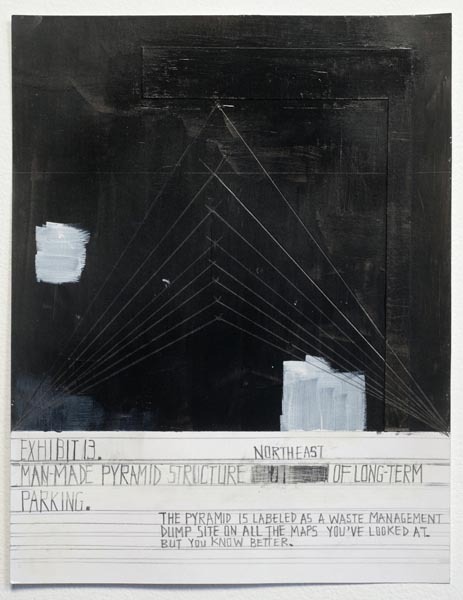 There is a fuzzy theme mixing the Denver Airport Conspiracy with some art-world Illuminati, but there isn’t a traditional story in three acts – no twist, no resolution, no Richard Serra reveal. It isn’t clear whether these fragmentary decisions reference narrative theory or conspiracy theory, but the jumbling gives character and adds an weird, “and then” conversational complexity familiar to the way these stories are told. Its true that I was a little disappointed by the pagination of Sokolow’s story, but it’s also true that I’ve been a fan of Sokolow’s for a few years and was expecting – and maybe looking forward to – more of the same. That’s on me, though; when The Strokes released First Impressions of Earth, I realized all I’d been wanting was Is This It – Volume 3, and when Kanye West dropped 808s + Heartbreak, I wished it was something like Nontraditional / Returning College Student. I might be a bad fan in that way, but Deb Sokolow is a better artist for ignoring me. She is like Kanye, yes. This solo Western exhibition was a necessary, assertive shift that produced solidly enjoyable artwork. It retained all the best elements of analytical drawing, engaged the artist’s book form in a cool and more direct way, and taught me a little about the correlation between revolution and fresh meats. It will be interesting to see where she goes next. 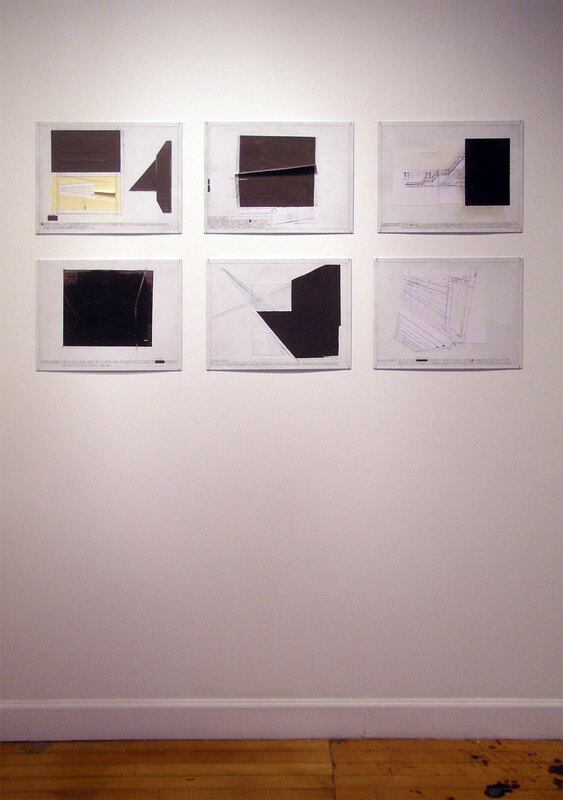 Deb Sokolow‘s exhibition ran from November 19th to December 31st @ Western Exhibitions, 119 N. Peoria St, Suite 2A.